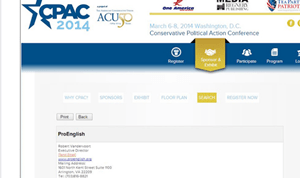 As the 2014 Conservative Political Action Conference (CPAC) kicks off just outside of Washington DC, and all the news networks scramble to cover it, not one is reporting about the fact that ProEnglish, the white nationalist led English-only outfit that created serious headaches for the conference back in 2012, has quietly been allowed to again be an official exhibitor at CPAC 2014. According to the CPAC 2014 event site, the ProEnglish booth is number 538, sandwiched between the booth for a movie about the IRS “scandal” and the booth for the group, Tradition, Family, Property. The site lists the ProEnglish contact for CPAC as Robert Vandervoort who was the organizer of the white supremacist group, Chicagoland Friends of American Renaissance, while he lived in Illinois. During that period Vandervoort was at the center of much of the white supremacist activity in the region. While he was in charge, Chicagoland Friends of American Renaissance often held joint meetings with the local chapter of the Council of Conservative Citizens. He also made appearances at white supremacist events outside Illinois, for instance participating in the 2009 Preserving Western Civilization Conference. ProEnglish, was founded by white nationalist John Tanton who also created a network of organizations – the Federation for American Immigration Reform (FAIR), the Center for Immigration Studies (CIS) and NumbersUSA – that have profoundly shaped the immigration debate in the United States. A retired Michigan ophthalmologist, Tanton has white nationalist beliefs and has written that to maintain American culture, “a European-American majority” is required. And there the group sits at CPAC14 while not one major television or print news network has the journalistic integrity or balls to report that they are there.